https://matcha-jp.com/en/greatertokyo/6540 Nikko Pass Trip: Day 1 - Enjoy The Breathtaking Nature Of Nikko! The Nikko Pass with its two variants - All Area (valid for 4 days, 4520 yen) and World Heritage Area (valid for 2 days, 2000 yen) - allows unlimited bus and train transportation in Nikko, the home of astounding nature and World Heritage Sites. Nikko, located north of Tokyo, is best known for being home to the exquisite World Heritage Sites of Nikko Toshogu Shrine, Rinnoji Temple and Futarasan Shrine. However, Nikko also has a long history as a summer resort area, favored especially by imperial princes and foreign diplomats who cherished the rich nature of this region. The most convenient way to travel to Nikko from Tokyo is using the Nikko Pass, which exists in two versions - the All Area Pass (4,520 yen), a 4-day ticket that includes a round trip from Tokyo to Nikko and unlimited train and bus rides in the Nikko-Yumoto Onsen-Chuzenji Onsen-Kinugawa Onsen area, and the World Heritage Area Pass (2,000 yen), a 2-day ticket that includes a round trip from Tokyo to Nikko and unlimited bus rides in the Nikko World Heritage area and the area around Nikko Station. In this article, we introduce a recommended itinerary that will allow you to enjoy the splendid nature of Nikko on your first day visiting here. 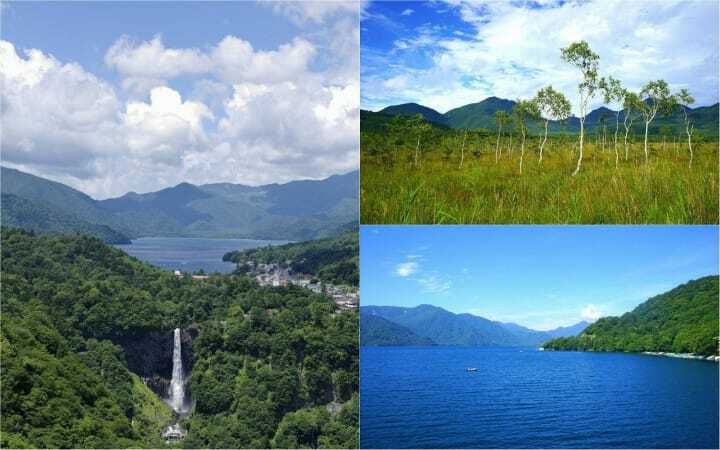 This course will take you to the part of Nikko that is located in the mountains, to Lake Chuzenji and Senjogahara Marshland, a natural heritage site. A day spent relishing the beauty of this area will help you understand what inspired the ascetics from ancient times to build here the amazing temples and shrines that are known today as Nikko's World Heritage Sites, which we recommend visiting on your second day in Nikko. The Nikko Pass can be purchased online, at TOBU Tourist Information Center ASAKUSA, and at the 1F Ticket Counter in Asakusa Station (Tobu Skytree Line). If you purchase your ticket online, the voucher you receive can be exchanged at TOBU TIC Asakusa for your Nikko Pass on the day of your trip. There is foreign language speaking staff available who can offer useful information. At the 1F Ticket Counter, the Nikko Pass can be bought from early in the morning when the first train departs to the last train in the evening. However, the staff at this counter will offer support in Japanese only, therefore it is recommended that you decide beforehand on the type of pass you wish to purchase and on the date when you start using it. Please be aware that the Nikko Pass does not include the entry fees to the natural and historical tourist attractions of Nikko. Also, if you travel to Nikko by limited express (which we strongly recommend for a time-saving, hassle-free ride), you'll have to book a limited express ticket. The limited express fare is discounted for Nikko Pass holders and is paid separately as it differs depending on train type. It won't exceed 1,160 yen for a one-way ride. TOBU Tourist Information Center ASAKUSA opens at 7:20, so if you plan to leave for Nikko early in the morning, we suggest buying the Nikko Pass beforehand so that you can take the 7:30 limited express train for Nikko. The route introduced in this article can be followed using the Nikko Pass All Area. Fixed holidays No closed days. Access Within Asakusa Station (Tobu Skytree Line) right near the main entrance (Ekimise building 1st floor). In order to reach Nikko as early as possible, I took the 7:30 Tobu Limited Express for Nikko from Asakusa Station. Instead of going through the ticket gates, show your Nikko Pass to the Tobu Railway staff positioned near the ticket gates. Once in Nikko, head for the bus stop which is right in front of Tobu Nikko Station. In order to reach Akechidaira Ropeway, the first recommended destination on our itinerary, I took the bus heading to Yumoto Onsen from platform 2A of the bus stop. Get on the bus through the front door and show your Nikko Pass to the driver. Please aware that you need to show your pass again when getting off the bus so keep you Nikko Pass at hand. 10:05 - 11:15 -- Akechidaira Ropeway - A Sweeping View of the Oku-Nikko Area! After a 40-minute bus ride, I got off at Akechidaira bus stop. The Akechidaira Ropeway station is a few meters away from the bus stop. Just show your Nikko Pass to the ropeway staff and you'll be guided to the first gondola. After a 3-minute ride on the Akechidaira Ropeway, you'll reach the Akechidaira Plateau which offers a breathtaking view of the entire area of Oku-Nikko. In the distance, you'll be able to see Lake Chuzenji, the Kegon Falls, and Mount Nantai, which has been an object of religious worship for many centuries. The view is especially beautiful in autumn when the forest changes color to many hues of red and yellow, creating a wonderful contrast to the blue waters of Lake Chuzenji. To make it in time to the next destination, please make sure to get back to the ground station no later than 11:05 to take the 11:15 bus that's heading to Yumoto Onsen. Our next stop is Kotoku Onsen - Nikko Astraea Hotel which will be reached at 11:50. Access 40 minutes by bus from Tobu Nikko Station or JR Nikko Station. Take the bus heading for Yumoto Onsen or Chuzenji Onsen and get off at Akechidaira bus stop. Nikko Astraea Hotel is a well-established hotel and onsen resort, ideal for those who seek to relax in tranquility. The hotel is located in the nature-rich area of Oku-Nikko. To enjoy some of the best cuisine of Nikko, we recommend having lunch at Nikko Astraea Hotel. I chose the Washoku Gozen set meal (2,000 yen) which includes delicious sashimi made of Nikko's famous yuba (tofu skin), rice, simmered beef and various other smaller side dishes. It was a typical Japanese, delicious meal. After lunch, we suggest taking a walk around the hotel. Kotoku Bokujo, Nikko's famous pasture, is located right in front of the hotel and right beside it is Kotoku Marsh, an area full of greenery that is part of Nikko National Park. Or how about trying the excellent hot springs at Nikko Astraea Hotel? Access 70 minutes by bus from Tobu Nikko Station or JR Nikko Station. Take the bus heading for Yumoto Onsen (via Kotoku) and get off at Kotoku Onsen Nikko Astraea. From Nikko Astraea Hotel, take the 14:02 bus for Yumoto Onsen and get off at Yutaki-iriguchi (i's only two stops away). A few steps away from the bus stop in the direction of your bus, there is a pathway to the left leading to Yudaki Falls. Measuring 70 meters in height and 30 meters in width, Yudaki Falls is the third of Nikko's famous waterfalls, along with Kegon Falls and Ryuzu Falls. It's a majestic and at the same time refreshing sight! To the right of the souvenir shop located in front of Yudaki Falls there's a gate you might miss unless you look for it. This is the entrance to the Senjogahara Marshland, a place of scenic beauty Nikko is famous for. The fence around the entrance is to prevent the intrusion of deer which could damage the ecosystem of the marshland. The 4.5 km long nature trail through Senjogahara Marshland, from Yudaki Falls to Akanuma, will take you through some of the most beautiful nature sights in Japan. There are several other hiking courses but this might be the easiest to walk. Senjogahara Marshland is part of the Nikko National Park and is a natural heritage site, with many unique types of flora and fauna. The first half of the trail goes along Yukawa River, whose clear waters are home to rare water plants and algae. The second half crosses a plateau flanked by the majestic mountains of Nikko. In this area, besides the enthusiastic hikers who walk the trail greeting each other when they meet, you'll spot many photographers taking pictures of the wild birds that inhabit Senjogahara. It is a truly beautiful trail that will make you realize just how rich is the natural environment of Nikko. Toward the end of the trail, the trail branches off in two: you can either choose to walk to the Ryuzu Falls which is 1.4 km away to the right, or head to Akanuma bus stop which is 200 m to the left. If you still have energy, feel free to go see the Ryuzu Falls too, but please be aware that you'll have to return to the Akanuma bus stop in time to take the bus (after 18:00, the bus comes at 18:10, 18:35 and 19:40). *Please also be aware that in autumn and winter, it becomes dark after 17:00. We don't recommend trekking in the dark. If you reach the Akanuma bus stop by 17:00, take the 17:05 bus heading to Nikko Station and get off after four stops, at Chuzenji Kanaya Hotel-Mae. Access 60 minutes from Tobu Nikko Station or JR Nikko Station. Take the bus for Yumoto Onsen and get off at Yutaki-iriguchi bus stop. The first thing you'll notice when getting off the bus at Chuzenji Kanaya Hotel-Mae bus stop is Lake Chuzenji, glistening in the light of dusk. It's the perfect moment to capture the beauty of Chuzenjiko, the lake located at the highest altitude in Japan - 1300 m above sea level. Chuzenji Kanaya Hotel is one of the best hotels in Nikko, with a history going back to the Meiji Period. This facility is the ideal choice for a relaxing stay in Nikko, as it provides wide, comfortable rooms, tranquil surroundings full of greenery, refined cuisine and excellent hot spring baths. Guests are welcome to while away in the lobby or in the lounge on the second floor, sipping a complementary cup of tea, browsing through the books in the lounge or gazing at the waters of Lake Chuzenji. The classic elegance of the facility will win anyone's heart! Dining at Chuzenji Kanaya Hotel is one of the finest experiences one can enjoy in Nikko. Guests can choose between two types of full-course dinner. Each dish is savory and beautifully arranged on the plate. Breakfast also consists of various tasty dishes that are a feast for the eye and will give one the energy for a new day of explorations in Nikko. Access 60 minutes by bus from Tobu Nikko Station or JR Nikko Station. Take the bus for Yumoto Onsen and get off at Chuzenji Kanaya Hotel-Mae bus stop. End of Day 1, Get Ready for Day 2! Our recommended itinerary for the first day of a trip using the Nikko Pass focused on relishing the astounding nature in Oku-Nikko, the part of Nikko that's located high in the mountains. On the second day of your trip, how about exploring the rich history of Nikko by taking a boat cruise on Lake Chuzenji and visiting Nikko's World Heritage Sites? You can read our recommended itinerary for day 2 HERE. For more information on touristic sites in Nikko and the Nikko Pass, please visit this official webpage dedicated to the Nikko Pass.